The oldest of Miss Betty’s sons is named Edward Lee Major, Jr., having been named for his father who preceded his mother in death. Lee, as his friends have always called him, played for a good friend of mine, Dan Goble, in his first year at the helm of CCHS in 1981. Lee played Defensive Tackle, making the All-State Team and ultimately matriculated to the Western Kentucky University where he would play college football. Lee was called by Coach Goble almost impossible to block and the best pass rusher on the team, in spite of the fact a young Jerry Reese, HS All-American, All-conference player at UK, and multi-year player in the NFL, played alongside Lee in that same front. John Major, probably the most like his mother, was described by Coach Goble as the nicest person on the team and the consummate team player. I remember John playing very well at CB, but then again he was a hero of mine so my memory of his play is far from objective. It is easy to see, with the benefit of hindsight, how playing at a Christian County Football program completely loaded at John’s position would hamper the amount of snaps anyone would play. Still, being referenced by a coaching legend like Dan Goble as the consummate team player is heady praise. I have never known a coach at any level that didn’t greatly appreciate players like that. Raymond McKenzie Mack Major and John are twins. I recall Mack being referenced, and I thought appropriately, as Mack Truck Major. Mack became a starter half-way through his Sophomore season and started for the 1982 4A State Champion Colonels. Perhaps even more indicative of his character is that he broke his ankle his Junior year and missed getting to play but never missed a single practice the entire year. Mack was described by Coach Goble as a peerless leader and incredibly strong, benching pressing over 300 pounds. That was quite a feat, in that day, for a player who played at about 190. Mack’s senior season he was back in action and lead Christian County to another 4A State Title making him the only starter in the game in 1982 who also started in 1984. In 1 and 1/2 years, Mack gained over 2,700 yards rushing from scrimmage, only fumbling one time his whole career, which Coach Goble said he didn’t count because Mack recovered it anyway. Mack learned from his father to always keep his feet churning as he was going down, thereby falling forward, and never backward. Neither Coach Goble nor I could recall a single carry where Mack failed to fall forward as he was getting tackled. So what does all this have to do with Miss Betty? A whole lot! There is a Proverb which says…Hear, my son, your father’s instruction, and forsake not your mother’s teaching, for they are a graceful garland for your head and pendants for your neck. Proverbs 1:8-9. The Major boys, up to whom I have always looked, never forsook Miss Betty’s teaching. They are even today; warm, kind, and exceedingly gracious. I could see Miss Betty’s bright eyes twinkling in all three of them, their wives, and children too. They remain a living testament to the loving, kind and gracious woman who I both knew and loved my entire life. I never heard her speak an unkind word to anyone and offered a seemingly endless fountain of encouragement to any and everyone she encountered. 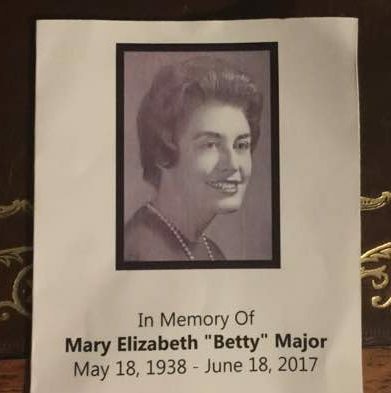 I told all three of her sons today, and I meant it as fully as I have ever meant anything, that Betty Major was the kindest, most gracious woman I had ever known. I have taken up writing, whether it be articles for Kentucky Prep Gridiron, my blog which is read on my show page administered by Village Connection Radio or my book For What It’s Worth: The Long Version. I don’t know exactly how to describe me other than I suppose I am somewhat of an essayist. I do not pretend to be anywhere near the talent of Diane Ackerman, who is a poet, essayist and naturalist known for her literary explorations of the natural world and who wrote, inter alia, A Natural History of the Senses. She said something once that makes me wonder whether she might have known Mary Elizabeth Betty Major. Diane Ackerman was quoted once saying I don’t want to get to the end of my life and find that I lived just the length of it. I want to have lived the width of it as well. As I sat in the First Christian Church today, and listened to all the people who had nothing but nice things to say about the Betty each of them knew and loved (because there just aren’t things which can be said about her that aren’t nice), I couldn’t help but think of how fully she lived life. I couldn’t help but think about how fully she loved her husband, sons, nieces and nephews, grandchildren and daughters-in-law. I couldn’t help but think about how fully she made me feel loved, whom she had nothing obligating her to love other than her devotion to Christianity. I couldn’t help but think she had lived a very full life and not just the length of it but the breadth of it too. May God bless and keep you clutched closely to his bosom Miss Betty. As it says in Timothy, you have fought a good fight, you have finished your course, you have kept the faith…Know you will be sorely missed and never replaced. Amen. As you can tell, she meant the world to me too. I have had a lot of unkind things said about me and deservedly I have no doubt but she never judged me or criticized me. I suppose she chose to love me in stead, which is what Jesus does. If there is an eternal reward, and I am sure there is, she is reaping it now. Patsy, thanks for the input and I hope Time is doing well and trust that he is. Please send him my warmest regards!